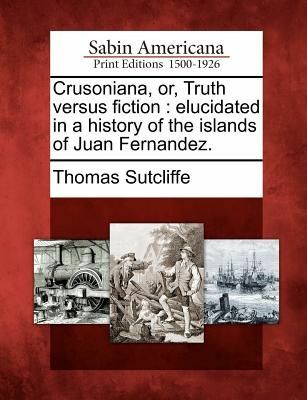 Title: Crusoniana, or, Truth versus fiction: elucidated in a history of the islands of Juan Fernandez.Author: Thomas SutcliffePublisher: Gale, Sabin Americana Description: Based on Joseph Sabin's famed bibliography, Bibliotheca Americana, Sabin Americana, 1500--1926 contains a collection of books, pamphlets, serials and other works about the Americas, from the time of their discovery to the early 1900s. Sabin Americana is rich in original accounts of discovery and exploration, pioneering and westward expansion, the U.S. Civil War and other military actions, Native Americans, slavery and abolition, religious history and more.Sabin Americana offers an up-close perspective on life in the western hemisphere, encompassing the arrival of the Europeans on the shores of North America in the late 15th century to the first decades of the 20th century. Covering a span of over 400 years in North, Central and South America as well as the Caribbean, this collection highlights the society, politics, religious beliefs, culture, contemporary opinions and momentous events of the time. It provides access to documents from an assortment of genres, sermons, political tracts, newspapers, books, pamphlets, maps, legislation, literature and more.Now for the first time, these high-quality digital scans of original works are available via print-on-demand, making them readily accessible to libraries, students, independent scholars, and readers of all ages.++++The below data was compiled from various identification fields in the bibliographic record of this title. This data is provided as an additional tool in helping to insure edition identification: ++++SourceLibrary: Huntington LibraryDocumentID: SABCP03387600CollectionID: CTRG00-B1394PublicationDate: 18430101SourceBibCitation: Selected Americana from Sabin's Dictionary of books relating to AmericaNotes: Appendix: "A statement of facts"; "Prospectus, opinions of the press ... "! 32] p., second group. "List of the clergy, nobility, and gentry who have already honoured my works on Chile, Peru, and Juan Fernandez, with their patronage." -- viii p., third group. "Additional subscribers"; "Catalogue"-- 2] p., fourth group.Collation: 213, 34! i.e. 32], viii,! 2] p.,! 5] leaves of plates: ill., map, facsims.